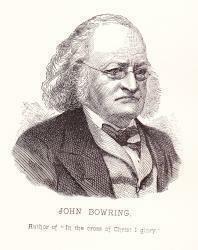 James Bowring was born at Exeter, in 1792. He possessed at an early age a remarkable power of attaining languages, and acquired some reputation by his metrical translations of foreign poems. He became editor of "The Westminster Review" in 1825, and was elected to Parliament in 1835. In 1849, he was appointed Consul at Canton, and in 1854, was made Governor of Hong Kong, and received the honour of knighthood. He is the author of some important works on politics and travel, and is the recipient of several testimonials from foreign governments and societies. His poems and hymns have also added to his reputation. His "Matins and Vespers" have passed through many editions. In religion he is a Unitarian. (1) Russian Anthology, with Biographical and Critical notices of the Poets of Russia, 1821; (2) Specimens of the Russian Poets, 1823; (3) Ancient Poetry and Romance of Spain, 1824; (4) Batavian Anthology, or Specimens of Dutch Poets, 1824; (5) Servian Popular Poetry, 1821; (6) Specimens of Polish Poets, 1827; (1) Poetry of the Magyars, 1830; (8) History of the Poetical Literature of Bohemia, 1832, &c.
(1) Matins and Vespers with Hymns and Occasional Devotional Pieces, Lond., 1823; 2nd edition, enlarged, 1824; 3rd edition, again enlarged, 1841; and the 4th, still further enlarged, in 1851. (2) Hymns: as a Sequel to the Matins, 1825. In addition he contributed to a few Unitarian hymnals, especially that of the Rev. J. R. Beard of Manchester, 1837. In that Collection many of the hymns added to the 3rd edition of Matins, &c, 1841, were first published A selection from these, together with a biographical sketch, was published by Lady Bowring in 1873, as a Memorial Volume of Sacred Poetry. This work contains hymns from the Matins and Vespers, together with others from Periodicals, and from his manuscripts. 1. Clay to clay, and dust to dust. Burial. From his Hymns, 1825, into the Hymn & Tune Book, Boston, U.S., 1868, &c.
2. Come the rich, and come the poor. Divine Worship. Contributed to Beard's Collection, 1837, No. 290, and repeated in Bowring's Matins, &c., 3rd edition, 1841. It is in a few American collections. 3. Drop the limpid waters now. Holy Baptism. From Matins and Vespers, 3rd edition, 1841, into Kennedy, 1863. 4. Earth's transitory things decay. The Memory of the Just. From his Hymns, 1825, into Beard, 1837; the American Plymouth Collection, 1855; and the Songs for the Sanctuary, N.Y., 1865, &c.
5. Father, glorify Thy name. The Father glorified. Also from Hymns, 1825, into Beard, 1837; the Hymns of the Spirit, Boston, U.S., 1864, &c.
6. Father and Friend, Thy light, Thy love. Omnipresence. From Matins and Vespers, 2nd edition, 1824, into several collections, and sometimes in an abbreviated form. 7. Father of Spirits, humbly bent before Thee. Also in Hymns, 1825, and Dr. Martineau's Hymns of Praise & Prayer, 1873. In Longfellow and Johnson's Hymns of the Spirit, Boston, U.S., 1864, it is given as, "Father of Spirits, gathered now before Thee." 8. From all evil, all temptation. Preservation implored. Contributed to Beard's Collection, 1837. 9. From the recesses of a lowly spirit. Prayer of trust. From Matins and Vespers, 1st edition, 1823, into several American collections. 10. Gather up, 0 earth, thy dead. Published in his Matins & Vespers, 3rd ed., 1841, in 3 stanzas of 8 lines and repeated, slightly altered, in Kennedy, 1863, No. 753. 11. Gently the shades of night descends Evening. A cento from his poem on "Sunday Evening," in the Matins, &c, 1st edition, 1823, p. 6. It is given in the Boston Hymns of the Spirit, 1864; the Boston Hymn & Tune Book, 1868, and other collections. 12. How dark, how desolate. Hope. 1st published in his Matins, &c, 1823, p. 246. In Dr. Martineau's Hymns of Praise & Prayer, 1873, it is No. 515. 13. How shall we praise Thee, Lord of Light! Evening. A cento from the same poem as No. 7 above. It is given in the Hymns of the Spirit, 1864, and other American collections. 14. Lead us with Thy gentle sway. Divine Guidance desired. Hymns, 1825, into Hymns of the Spirit, 1864, and others. 15. Lord, in heaven, Thy dwelling-place. Praise. Contributed to Beard's Collection, 1837, No. 70, repeated in the author's Matins, &c, 3rd edition 1841, p. 235, and given in a few American collections. In the Hymns of the Spirit, 1864, it is altered to "Lord of every time and place." 16. 0 let my [thy] trembling soul be still. Resignation. From the 1st edition of the Matins, &c, 1823, p. 251, in 3 stanzas of 6 lines, into Beard's Collection, 1837; the Hymns of the Spirit, 1864, and others. It is sometimes given as, "0 let thy," &c.
17. 0, sweet it is to feel and know. Monday Morning. A poem in 16 stanzas of 4 lines, given in his Matins, &c, 1823, p. 60. In 1837 stanzas i.-iii. were given in Beard's Collection as No. 448, and entitled "God near in sorrow." In the 3rd edition of the Matins, &c, 1841, this cento was repeated (p. 245), with the same title, notwithstanding the full poem was in the same book. 19. The heavenly spheres to Thee, 0 God. Evening. This "Hymn to the Deity" appeared in the 2nd edition of his Matins, &c, 1824, pp. 235-6, in 4 stanzas of 4 double lines. It is also in the 3rd edition, 1841; the Boston Hymns of the Spirit, 1864 and other American collections. 20. When before Thy throne we kneel. Divine Worship. From his Hymns, 1825, into Beard's Collection, 1837, No. 93; the Boston Hymn & Tune Book, 1868, No. 21, and others. 21. Where is thy sting, 0 death! Death. Also from the Hymns, 1825, into the same collections as No. 20 above. A Collection of Hymns for Public and Private Worship. Compiled by John R. Board, Lond., John Green, 1837. The Rev. John Relly Beard was an Unitarian Minister in Manchester, and the collection is dedicated "To the Manchester Meeting of Ministers." It contained a large number of original hymns. Bowring contributed 82, of which 33 were published therein for the first time. Some of his hymns are of great merit, and most of them are characterised by great earnestness and deep devotion. 1. Our God is nigh. Divine Presence. 2. 'Tis not the gift; but 'tis the spirit. Outward and Inward Virtue. 3. When the storms of sorrow gather. God our Guide. 7. Who shall roll away the stone? Easter. In Beard's Collection, 1837, and Matins & Vespers, 1841.